While not as impressive as other Super Heroes polybags such as 30168-1: Iron Patriot: Gun Mounting System or 5002126-1: Martian Manhunter, 5000022-1: The Hulk is nonetheless a good minifigure-only set and being a liscensed minifigure the Hulk is superbly detailed, down to the stiching in his torn purple pants. Being an exclusive polybag that only contains a minifigure this set has all unique parts except for Hulk's hairpiece and at the current time it looks safe to assume that this figure and the polybag itself will not be made available in any further sets or promotions. 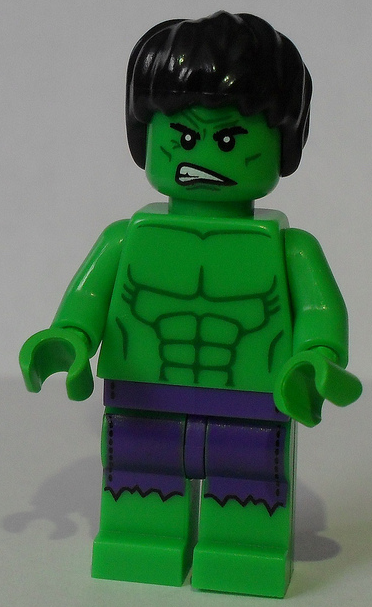 On his head Hulk uses the messy black hairpeice introduced and used by the titular character of the Harry Potter theme, he also has a dual-expressive head with one side being enraged while the other is a slightly less angry scowl. His torso is green with plain light green arms and hands, the front of his torso is detailed with grey shadowing to show his muscled chest. Hulk's famous purple pants (printed on green legs with purple hips) are again very well detailed with black stiching along the edges and ragged tears partway down. Unfortunately the leg detailing doesn't continue along the side or back of his legs which makes hulk's pants seem more like an apron than actual pants. 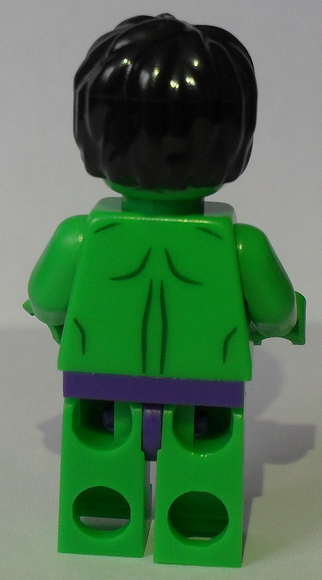 Hulk's back is very simple with the only printing showing his back torso muscles. Since this set is a poly-bag it's obviously quite small and relies more on adding this set to another, that being said he's an okay fit with other figures and playsets but he's not as imposing as his larger version. Even though Hulk is a major caharacter in the Marvel universe the small version of him doesn't seem like a good figure. The build of course is simply one standard figure with hair. 5000022: Hulk was a free promotional set given away with purchases of CA $75 or more, therefore there isn't a MSRP and no real investment in the set itself. If you're looking to buy online from a reseller and add Hulk to your collection I would say that even though I don't like to spend much money on individual figures I would pay a maximum of $10 for a sealed 5000022: Hulk. If you're looking to buy it for investment purposes I would try to stay below $12 ( a bit under half of the Bricklink selling price) though you could justify $15. Super Heroes is one of the most popular themes currently available and is no doubt aided by the recent and ongoing movies and cartoons. This version of the Hulk seems to based on or is a homage to the classic Lou Ferrigno Hulk that appeared in the live-action Hulk T.V. show from the 70's. This set was, and so far is, exclusive to the promotion offer from May 2012 where it was given out with purchases of more than CA $75, and unless lego decides to make more for another promotion (which seems highly unlikely) it will probably stay that way. 5000022: Hulk, like most single figure sets, comes in the standard plastic polybag. As far as minifigures go this small version of the Hulk makes an okay display piece, even though he has no accessories, but he goes pretty well with the other members of the Avenger such as Iron Man, Thor and Captain America. Even though the figure is printed with fine detail Hulk doesn't really feel like the Hulk, he's a standard minifigure who, as mentioned before, pales in comparaison to and seems especially scrawny when set beside the large Hulk. Nonetheless 5000022: Hulk will make a good addition to your collection and/or portfolio. If you got this for free as part of the promotion and like the figure I would keep it since it seems unlikely that it will be released in another set any time soon or perhaps ever, if you don't really care for the figure now is probably as good a time as any to sell since it has likely already reached its maximum appreciation level. If you're looking to buy this figure for your personal collection or to resell now is the time to do it since it's still gaining appreciation on the market and you may be able to get it for a low fee.